« Mirror, Mirror, on the Wall, Where are Workers Pillaged Worst of All? Because of their aggressive support for bigger government, my least-favorite international bureaucracies are the International Monetary Fund and the Organization for Economic Cooperation and Development. But I’m increasingly displeased by the European Bank for Reconstruction and Development, which is another international bureaucracy (like the OECD and IMF) that is backed by American taxpayers. And what does it do with our money? 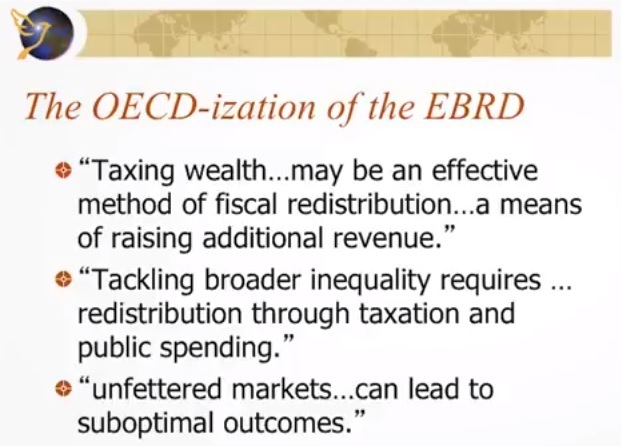 As I explained earlier this month in this short speech to the European Resource Bank in Prague, the EBRD undermines growth with cronyist policies that distort the allocation of capital. In some sense, the argument against the EBRD is no different than the standard argument against foreign aid. Simply stated, you don’t generate growth by having the government of a rich nation give money to the government of a poor nation. Poor nations instead need to adopt good policy – something that’s less likely when profligate and corrupt governments in the developing world are propped up by handouts. That being said, the downsides of the EBRD go well beyond the normal problems of foreign aid. I recently authored a study on this bureaucracy for the Center for Freedom and Prosperity. The EBRD was created with the best of intentions. The collapse of communism was an unprecedented and largely unexpected event, and policymakers wanted to encourage and facilitate a shift to markets and democracy. …But good intentions don’t necessarily mean good results. Especially when the core premise was that growth somehow would be stimulated and enabled by the creation of another multilateral government bureaucracy. …Unfortunately, even though its founding documents pay homage to markets…, there’s nothing in the track record of the EBRD that indicates it has learned from pro-intervention and pro-statism mistakes made by older international aid organizations. Indeed, there’s no positive track record whatsoever. 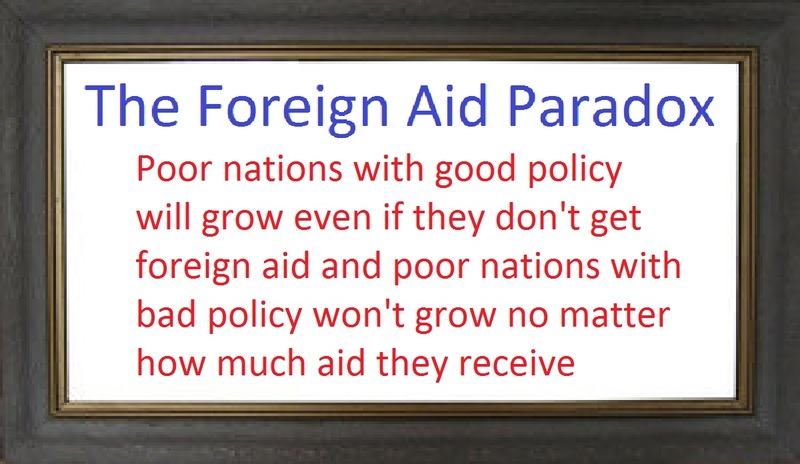 • There is no evidence that nations receiving subsidies and other forms of assistance grow faster than similar nations that don’t get aid from the EBRD. • There is no evidence that nations receiving subsidies and other forms of assistance have better social outcomes than similar nations that don’t get aid from the EBRD. I also delved into three specific downsides of the EBRD, starting with its role in misallocating capital. In a normal economy, savers, investors, intermediaries, entrepreneurs, and others make decisions on what projects get funded and what businesses attract investment. These private-sector participants have “skin in the game” and relentlessly seek to balance risk and reward. Wise decisions are rewarded by profit, which often is a signal for additional investment to help satisfy consumer desires. There’s also an incentive to quickly disengage from failing projects and investments that don’t produce goods and services valued by consumers. Profit and loss are an effective feedback mechanism to ensure that resources are constantly being reshuffled in ways that produce the most prosperity for people. The EBRD interferes with that process. Every euro it allocates necessarily diverts capital from more optimal uses. I explain why taxpayers shouldn’t be subsidizing cronyism. …the EBRD is in the business of “picking winners and losers.” This means that intervention by the bureaucracy necessarily distorts competitive markets. Any firm that gets money from the EBRD is going to have a significant advantage over rival companies. Preferential financing for hand-picked firms from the EBRD also is a way of deterring new companies from getting started since there is not a level playing field or honest competition. … cronyism is a threat to prosperity. It means the playing field is unlevel and that those with political connections have an unfair advantage over those who compete fairly. To make matters worse, nations that receive funds from the ERBD already get dismal scores from Economic Freedom of the World for the two subcategories (“government enterprises and investment” and “business regulations”) that presumably are the best proxies for cronyism. 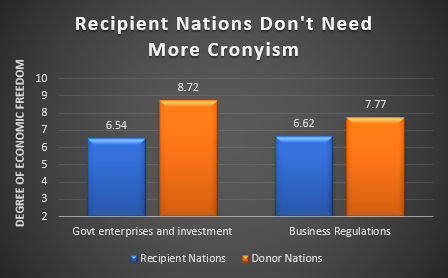 Here’s a chart from the study showing that recipient nations already get low scores from Economic Freedom of the World for variables that reflect the degree of cronyism in an economy. Last but not least, I warn that the EBRD enables and facilitates corruption. When governments have power to arbitrarily disburse large sums of money, that is a recipe for unsavory behavior. For all intents and purposes, the practice of cronyism is a prerequisite for corruption. The EBRD openly brags about the money it steers to private hands, so is it any surprise that people will engage in dodgy behavior in order to turn those public funds into private loot? …Recipient nations get comparatively poor scores for “legal system and property rights” from Economic Freedom of the World. They also do relatively poorly when looking at the World Bank’s “governance indicators.” And they also have disappointing numbers from Transparency International’s “corruption perceptions index.” So, it’s no surprise that monies ostensibly disbursed for the purpose of development assistance wind up lining the pockets of corrupt insiders. For all intents and purposes, the EBRD and other dispensers of aid enable and sustain patterns of corruption. 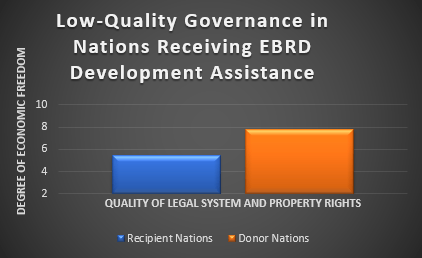 And here’s the chart showing that recipient nations have poor quality of governance, which means that EBRD funds are especially likely to get misused. I also cite several EBRD documents that illustrates the bureaucracy’s hostility for free markets and limited government. Just in case you didn’t want to watch the entire video, here’s the relevant slide from my presentation. And remember that your tax dollars back this European bureaucracy. Indeed, American taxpayers have a larger exposure than any of the European countries. P.S. I’m also not a fan of the United Nations, though I take comfort in the fact that the UN is not very effective in pushing statist policy. P.P.S. I’m most tolerant of the World Bank, though that bureaucracy periodically does foolish things as well. I think there is one thing that rich governments can do to help poor ones grow. You may not like it, but military alliances, defence associations, call them what you will, where the rich country chips in say 4% of national income and the poor country chips in say <1% of its national income – these seem to be tremendous success stories. For sure, the poor country is free riding on the military generosity of the richer one, with all the poor countries engineers and scientists going into the market economy rather than the defence economy, but it certainly correlates with the poorer one catching up economically. I have advised both EBRD and WB and from my experience with them, I may say that size counts. The bigger the bureaucracy the more cronyism prospers. will someone please remind me why we are doing this? Excellent. BUT it is worse. Reseach has actually shown that African countries that receive aid are more likely to regress and more likely to devolve into civil wars. Aid fosters a tribute economy. The aid becomes something worth fighting over/for. They fight for the right to receive the foreign aid tribute. These nations are presented with a medicine pretending to be a cure that is worse than the disease. The research and writing of Dambisa Moyo – a former World Bank consultant is a powerful message for the cessation of aid.